Come to your senses... ... and draw closer to God Whether it's a glimpse of a beautifully marked butterfly, the scent of a lilac bush or the shrill cry of a new baby, every day you experience God's creation through the gift of your senses. As intricate and awesome as our physical senses are, they can provide us with information that transcends the natural when we realize what each one signifies in the spiritual realm. Together they provide a road map to a more intimate relationship with God. This insightful Bible study shows the new Christian as well as the seasoned believer how to taste and see that the Lord is good, and how we can let the Lord be our vision and give us discernment. It also warns of the spiritual pitfalls that result when we misuse God's gifts of taste, touch, sight, hearing and smell. "God is immense, vast, and transcendent, but Tammy Melton shows biblically that He is also intimate, close, and somehow knowable. Tammy's unique premise is not one of manipulation or formula, but of discipline and mystery. 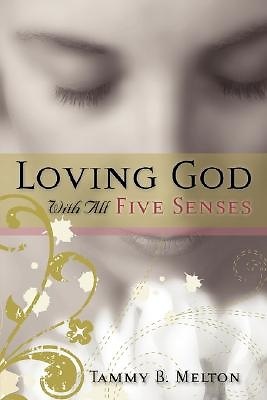 Loving God With All Five Senses will inevitably breathe life into your extraordinary journey of pursuing God. Tammy does not talk of loving God; she embodies it " Mark J. Anthony Pastor, Trinity Fellowship Church, Sharpsburg, Georgia Tammy Melton is a Christian speaker, author, and founder of Legacy Ministries for Christ, Incorporated in Fayetteville, Georgia. Tammy loves to encourage and train individuals in the body of Christ to allow God to reveal to them their unique purposes and remove all hindrances that keep them from fulfilling their destinies. She has a passion to let people know that they can experience intimacy with their Creator Tammy is married to Bill Melton and has two daughters, Amy and Amber.